Western blot analysis of extracts from Akt1 (-/-) mouse embryonic fibroblasts (MEF) or Akt2 (-/-) MEF, untreated (-) or treated with Human Platelet-Derived Growth Factor AA (hPDGF-AA) #8913 (100 ng/ml, 15 min; +), using Phospho-Akt2 (Ser474) (D3H2) Rabbit mAb (upper), Phospho-Akt (Ser473) (D9E) XP® Rabbit mAb #4060 (middle), or Akt (pan) (C67E7) Rabbit mAb #4691 (lower). Western blot analysis of extracts from LNCaP cells, transfected with a construct expressing Akt1 shRNA or Akt2 shRNA, uninduced (-) or doxycycline-induced for the indicated times, using Phospho-Akt1 (Ser473) (D7F10) XP® Rabbit mAb (Akt1 Specific) #9018 (top), Phospho-Akt2 (Ser474) (D3H2) Rabbit mAb (Akt2 Specific) (2nd from top), Akt1 (C73H10) Rabbit mAb #2938 (middle), Akt2 (D6G4) Rabbit mAb #3063 (2nd from bottom), or PI3 Kinase p85 (19H8) Rabbit mAb #4257 (bottom). (Data kindly provided by Drs. Rebecca Chin and Alex Toker, Beth Israel Deaconess Medical Center and Harvard Medical School, Boston, MA). 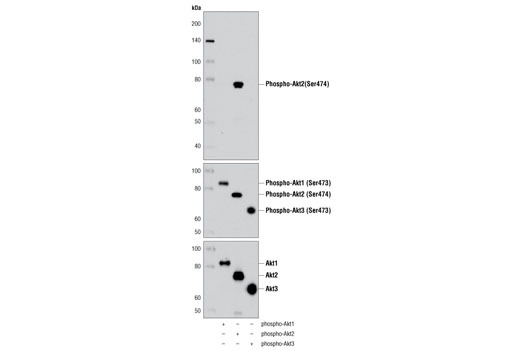 Western blot analysis of purified recombinant phospho-Akt1, phospho-Akt2 and phospho-Akt3 proteins using Phospho-Akt2 (Ser474) (D3H2) Rabbit mAb (Akt2 Specific) (upper), Phospho-Akt (Ser473) (D9E) XP® Rabbit mAb #4060 (middle) and Akt (pan) (C67E7) Rabbit mAb #4691 (lower). 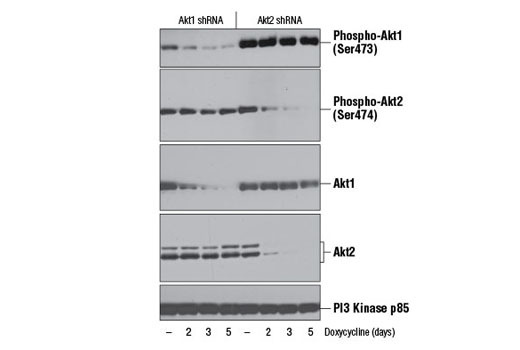 Phospho-Akt2 (Ser474) (D3H2) Rabbit mAb (Akt2 Specific) recognizes endogenous levels of Akt2 protein only when phosphorylated at Ser474. 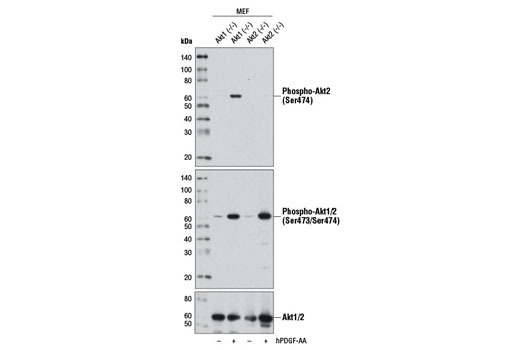 This antibody does not cross-react with Akt1 protein when phosphorylated at Ser473 or with Akt3 protein when phosphorylated at Ser472. Monoclonal antibody is produced by immunizing animals with a synthetic phosphopeptide corresponding to residues surrounding Ser474 of human Akt2 protein.